It is not enough for certain kinds of people to despise truth. They can’t just express their lack of interest and walk away. I suspect every Christian who has ever shared his or her faith has run into people who have no trouble making their lack of interest clear, and no trouble beating feet. I think it’s fairly normal. Picture yourself talking to someone about the love of Christ and the things in his word that have become intensely precious to you; the things that make it worth getting out of bed every morning; the things for which you and I live. Now of course if you’re like me, you’re not a perfect communicator. You might be a little self-conscious or clumsy. You might wander off down some theological rabbit trail and forget the relevant point that you originally intended to make. You might blather or get embarrassed at your own ineptitude. You might wince to hear a few of your own phrases sounding too churchy, too phony or too contrived. I certainly do; there are always a few clunkers that fall out of my mouth when I feel put on the spot. But let’s say you manage to get something out. When you finally shut up you realize your listener is neither offended nor angry; if anything they are a little bored. They just plain don’t get it. It means no more to them than an enthusiastic discourse on Keynesian economic theory or the merits of golf would mean to me. They can’t wait to change the subject, not because they are under conviction but — let’s be honest — because they would rather discuss something that actually matters to them. They are just not there with you, and you can’t bring them there yet. With such a person, it’s not impossible to imagine that if their circumstances change and if the Holy Spirit begins to deal with them directly on the subjects of sin and righteousness and judgment, they might be willing to reconsider anything you said that has inadvertently lodged in their memories. At the very least they’ll remember you showed some spiritual interest in them. These are not the sorts of people I’m thinking about today. I’m thinking of another sort entirely. A few days ago in a post entitled “Thank You for the Failures” I had a few thoughts about why God conceals his plans and purposes from certain types of individuals. The most obvious reasons are that, being omniscient, both the Father and the Lord Jesus are well aware when men and women have receptive hearts and when they don’t, and they tend not to entrust valuable truth to those who care nothing about it. But keeping pearls from those of a more porcine disposition is not just about the inability to recognize or value truth. Yes, most of Israel was disinclined to listen. Spiritually, they were deaf as posts. “From of old your ear has not been opened”, God says. But he goes on to add this: “I knew that you would surely deal treacherously”. That’s why he has nothing to say to them. And when he does have something new to announce, rest assured they will be the very last ones to know because if they DID know, they’d do something wicked and unconscionable with the knowledge. That’s what it means to be treacherous. It is not enough for certain kinds of people to despise truth. They can’t just express their lack of interest and walk away. No, for some folks it becomes their mission to make sure that nobody else ever enjoys the pearls they themselves despise. So God hides truth from these people not just because the truth itself is of value and because he knows those people despise it, but because when you entrust anything of value to them, they tend to hurt others with it. By using a word like “treacherous”, as scripture does, I am in no way suggesting that every move of such individuals is deliberate and calculated to destroy others. No, they can simply be so self-absorbed that they fail to take the obvious consequences of their own words and actions into account. Or perhaps they simply don’t care. The havoc they wreak is frequently accidental. If they knew the sort of damage for which they were actually responsible, many would be as surprised as their victims and acolytes. 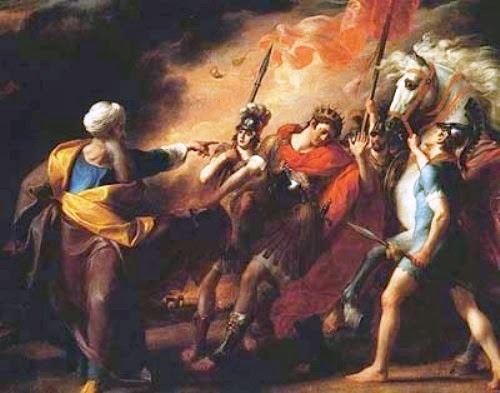 This is what Saul did when, trying to impress Israel with his kingly intensity, he took an oath on behalf of all the people. He said, “Cursed be the man who eats food until it is evening and I have avenged myself on my enemies”. Unfortunately the ‘strong arm of Saul’ failed to deliver a victory in the timeframe he had envisaged. As a result, none of the people had tasted food all day, and they became ravenous. Saul’s rash oath nearly got his own son Jonathan killed, and it caused the people to become so hungry that they ate meat without cooking it, bringing judgment on the nation because they were in violation of the Law of Moses. The prophet Samuel, confronted with this spectacle, said to Saul, “You have dealt treacherously”. Sometimes when you put your ego first, all kinds of people get hurt by it in ways you may never have imagined. That’s treachery, and it’s the kind of thing Isaiah spoke against. God ultimately removed Saul and gave the kingdom to David. Surely one reason he did so was the damage Saul did to Israel during his reign because of his own treacherous self-importance. Job uses this same word “treacherous” when he speaks of the so-called comfort of Eliphaz, his friend. Eliphaz sees Job suffering and makes the argument that Job must have committed some sin in order to be suffering the way he is. Surely, Eliphaz argues, God would not inflict torment on someone unless it was richly deserved. He encourages Job to repent. Mischaracterizing God is a form of treachery. Taking the advice of people like Eliphaz is much like being caught in the rapids, heading speedily for Niagara Falls. We ought to be very careful about passing judgment on those who are afflicted in this world. What we say about their situation reflects on their Maker, as the words of Eliphaz did. He was self-righteous, and he was dead wrong. His words were treacherous; potentially destructive to everyone who heard them. God rightly judged him, and he was only saved by Job’s prayers. In the book of Jeremiah, God compares the conduct of Israel to the conduct of “a treacherous wife [that] leaves her husband”. A wife may leave her husband because he has mistreated her, but this is not the case with God and Israel. Israel had deserted her God because she thought she’d found something better: more secure, more romantic. In her mind, she was trading up. The nation had the notion that it was somehow entitled to a better situation. This is the sort of thing God calls treachery. He says to his treacherous ‘wife’ “Truly the hills are a delusion, the orgies on the mountains …” There is no excitement, no romance and no security to be found outside of God, though a self-indulgent mindset will certainly make every effort to convince you otherwise. The treacherously self-indulgent individual betrays others because their own happiness always comes first. It should not come as a surprise that God has no truth to share with such a person. Given truth, they will take it, warp it and try to make it entirely about themselves. People like this are all over the Internet, taking the words of God and distorting them: telling us they confer rights rather than responsibilities, compelling others to serve their whims rather than serving others, and redefining love to mean whatever is most convenient for them. Such is the nature of the treachery of which Isaiah accuses those who reject the word of God. Treachery is not always a clear-headed, self-aware act during which the obviously wicked foam at the mouth and delight in the number of others their example will enable them to take down with them. Most of the treacherous do not rage at God. The sort of treachery Isaiah is talking about is really a form of self-deception in which opinions, ego and perceived happiness receive a higher priority than obedience and duty. Treachery is less about attacking God and more about choosing me; first, foremost and always. Treachery is bound up with self, but it destroys those who are dull enough to pay attention and credulous enough to believe its lies. "The most obvious reasons are that, being omniscient, both the Father and the Lord Jesus are well aware when men and women have receptive hearts and when they don’t, and they tend not to entrust valuable truth to those who care nothing about it." With regard to the above point, I have not yet seen you deal with the argument below (maybe I missed it) which is a typical, but fairly valid, response to the above from the Ag/Atheist crowd. I think IC may have dealt with it in a different forum but I forgot. The timeline would be questioned. Did the non-receptive hearts come into existence with birth or only after a person has permitted that deterioration later on. In the former case the Ag/At camp will argue that God is clearly responsible for creating such hearts in the first place. If not by deliberate selection then at least by chance. For the second case, he could simply have willed to create persons and/or hearts that would be less likely to suffer corruption. In either case, his choice. Also, let's not forget the environmental factors that go into shaping a person. Now, obviously, this somehow ties into the free will argument except, how is that synchronized with a timeline? I realize of course that this is simply a strategy of shifting the blame right back to our creator. But, would the Ag/At crowd have a somewhat valid argument? How to rationalize man's free will versus an all-controlling God? I know which way the Calvinist falls - there is no free will because God causes all including the flawed hearts He will later condemn. I know which way the Atheist would lean - there is no free will and there is no God - only material causes that conform to laws we are working to discover. I don't have an answer that will fully satisfy either camp because - in large measure - they are entrenched and unmoving. Time will eventually rebut both with far more eloquence than I can muster. The best I can offer on short order is this: there is a vast difference between knowledge and causation. And I add my own experience (which - not surprisingly - is the same image God uses again and again in scripture). Because in my home is someone that, in a very real sense, *I* made (my wife had something to do with at as well). He has my DNA, he carries my name, he is made in my image, he was (and largely remains) utterly dependent on me for his very existence - without me he could not survive. I chose to have this invader in my home. I chose to have a son. I knew, even before he was conceived and with a metaphysical precision and certainty, that he would at times disappoint, disobey and discourage me. Unlike God I didn't know the exact moments and ways he would do so, but I knew it would happen. In fact I can write this today confident that it will continue to happen tomorrow and beyond. But my wife and I chose to have him regardless. Why? Because he is a tangible expression of love, he is an object of our intentional blessing despite his flaws. It it is impossible now for me to imagine life without him. We are not infrequently referred to as God's children. I think His relationship with us is very much like that of a father and child. I suspect that part of being made "in God's image" is the ability to choose and create from a free will. That's something a materialist's achingly narrow view of things prohibits and it's something the Calvinist feels sure is an affront to God. But I do not accept either view and believe He has planted in the midst of every family a reminder of the way we have been made. The way God speaks of the lost is often flavoured with the tenderness of a Father who has lost a son - "I take no pleasure in the death of the wicked" for example. So too I think of Christ weeping over a rejecting Jerusalem, calling Judas "friend" while Judas betrayed Him, loving a rich young ruler who would choose material and temporal wealth over an eternal destiny with a loving God. I have no doubt - at all - that God knows what we will do with each breath we draw. Some will reject, some will repent and accept. This is exactly what we should expect to see if man were truly free and God were truly loving.